Nameles provides an easy to deploy, scalable IVT detection and filtering solution that is proven to detect at a high level of accuracy ad fraud and other types of invalid traffic such as web scraping. More detailed information related with setup options is provided below. While absolute measurement of detection capability is impossible, Nameles is the only detection solution that can be audited by indepedent parties and that is backed by several scientfic papers. Nameles implements a highly scalable entropy measurement using Shannon entropy of the IP addresses a given site is receiving traffic from, and then assigns a normalized score to the site based on its traffic pattern. Entropy have been used widely in finance, intelligence, and other fields where dealing with vast amounts of data and many unknowns characterize the problem. The use of Shannon entropy has been covered in hundreds of scientific papers. Some argue that Shannon received it from Alan Turing himself, and that it was the method Turing used for cracking the Nazi code. The scoring-module replies to the query messages sent by DSP with the confidence score of the domain and the category in which the domain falls, based on the statistical thresholds of outlierness. In addition, the scoring-module forwards the messages to the data-processing-module for updating the scores at the end of the day. Modules communicate using zeromq. Figure 1 presents a high level representation of Nameles functional blocks. 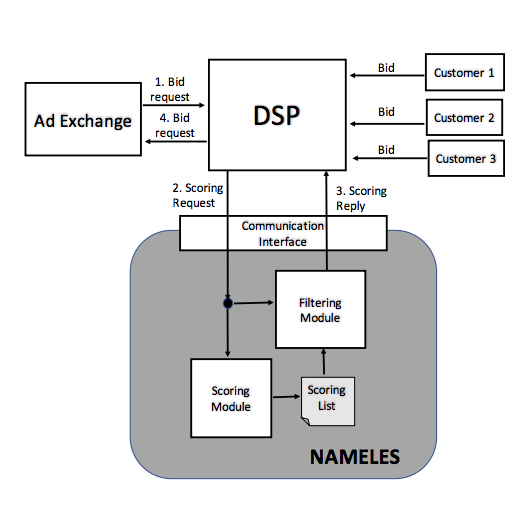 Moreover, the figure shows how Nameles could be integrated in the programmatic ad delivery chain as an auxiliary service for the DSPs. The only difference with respect to the current operation of a DSP would be that, as part of the pre-bid phase, the DSP makes a request to Nameles to provide a Confidence Score per bid request. To this end, the DSP sends a scoring request to Nameles (step 2 in Figure 3). The scoring request includes the following fields: bid request id (mapping Nameles result to the corresponding bid request), IP address of the device associated with the bid event and the domain offering the ad space. This information is included in the bid requests as defined in the openRTB protocol standard. The scoring request is delivered to two independent modules of Nameles: the Scoring module and the Filtering module. The scoring-module runs several worker threads that pull the queries from the DSP end and push the reply messages. The workers perform a single lookup in a shared hash table for each message. Therefore, the host running the scoring-module module requires minimal memory and drive. We recommend setting a worker per CPU and running latency tests with your expected throughtput load in order to dimensionate an appropriate number of processors for the host. Note that you can run several scoring modules in your system communicating with the same data processing module. The data-processing-module performs precomputations with the stream of data received from the scoring module. The data is periodically serialized to a PostgreSQL database. The scores are computed at the end of each day. The host of this module would benefit from having a high amount of RAM and a certain number of processors in order to reduce the score computation times. We recommend at least 64GB of RAM and 4 cores. In the case of a DSP a response to a given bid request has to be received by the Ad Exchange within 100 ms. Hence, the delay introduced by Nameles is limited to few ms in order to minimize the impact in the overall bidding process delay. This ensures that also in Exchange use, the strict requirements for avoiding delays on publisher websites are avoided. Figure 2 the performance of Nameles once deployed. The x-axis shows the different tested scoring request rates. 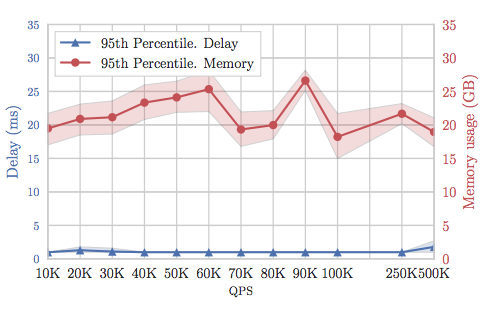 The left y-axis and right y-axis show the 95-percentile filtering delay and 95-percentile memory consumption for the different scoring request rates (QPS). The line in the figure represents the average of 95-percentile values across the 5 experiments whereas the lighter color area shows the max and min 95-percentile values. Nameles have been built and tested on Ubuntu / Debian systems. If you install Nameles on a multiple machine docker cluster/swarm, then you have two options: a) where you let docker allocate resources per service b) where you allocate reseources yourself. You will have to create another shell, as in the shell where you run the setup now you will have a running docker instance. The dsp-emulator module can be used as an example for interfacing Nameles from your infrastructure, i.e. message formatting and zeromq port bindings. The latency test source code is implemented in C++ but a different language for which zeromq is available could be used. Note that after each command you have to start a new shell, as the current shell has a container running in it.